Royal Caribbean's Anthem of the Seas canceled the remainder of an Anthem of the Seas sailing due to a forecasted storm off the coast of Cape Hatteras, North Carolina. Royal Caribbean announced that the ship would return to Cape Liberty immediately to avoid, "a severe storm". The decision was made to provide its guests with a comfortable journey back home. Royal Caribbean is exercising extreme caution following an incident earlier this month, where Anthem of the Seas ran into a stronger than expected storm in the Atlantic that saw hurricane force winds and caused some superficial damage. Royal Caribbean released a statement regarding the decision, "The safety and comfort of our guests and crew is always our first priority." "On a recent sailing, Anthem of the Seas experienced bad weather that was much worse than forecast; therefore, we want to be extra cautious about our guests' safety and comfort when it comes to weather in the area. That is why we have decided to head back to Cape Liberty immediately so that we can stay a safe distance from the storm." Royal Caribbean CEO Michael Bayley provided an update on Anthem of the Seas to travel agencies following a stronger than expected winter storm earlier this month. Bayley reitterated how well the ship held up structurally despite the strong winds and large waves and provided an update on the ship's repairs. According to Bayley, there are a handful of remaining minor issues that require attention including replacing outdoor ceiling paneling by the SeaPlex, repairing some balcony partitions and replacing broken furniture. North Star, RipCord by iFLY, FlowRider and other favorite experiences are fully operational. Bayley added that Royal Caribbean has updated their storm avoidance policy and added additional resources at their headquarters to provide more data and guidance to support our captains. Senior marine executives and, when necessary, meteorologists will be involved in decisions about when, where and whether to sail when storms are forecast. To the question about how the incident was allowed to happen in the first place, Bayley indicated the severity of the storm, "far exceeded forecasts, but ultimately it is our responsibility to avoid these possibilities – and this event has provided us with an important learning opportunity. We can do better, and we will." UPDATE: 3:58PM: Coast Guard officials have said the damaged azipod has been replaced and Coast Guard officials are examining it along with the ship's lifeboats and other safety equipment to see if they meet standards. The ship can safely maneuver with one azipod, Rowe said. The United States Coast Guard reports that the major storm Royal Caribbean's Anthem of the Seas ran into last week damaged part of its propulsion system. Coast Guard spokesman Charles Rowe says the Anthem of the Seas' left azipod was rendered inoperable during the storm. An azipod is a propeller that's mounted to a steerable pod that contains an electric motor. According to Rowe, Royal Caribbean informed the Coast Guard prior to the ship returning to its homeport of Bayonne. Despite the damage, Rowe indicated the ship can safely maneuver with a single azipod. The Coast Guard says the ship sustained largely cosmetic damage, including broken glass, china and balcony doors. Anthem of the Seas encountered a major storm last weekend that saw hurricane-strength conditions and forced the ship to return home early. Royal Caribbean's Anthem of the Seas returned home to Cape Liberty, New Jersey this evening and the cruise line is offering its guests and crew an apology and a promise to avoid similar situations in the future. In a statement issued by Royal Caribbean, the company apologized for its ship encountering sustained 120-mph winds during a winter storm off the coast of the Carolinas. "We apologize for exposing our guests and crew to the weather they faced, and for what they went through." Royal Caribbean also announced new plans to avoid storms like this with improved guidance. Royal Caribbean, "identified gaps" in their planning system and acknowledged, "what happened this week showed that we need to do better." Furthermore, Royal Caribbean announced their are strengthening their storm avoidance policy, and have added resources at their Miami headquarters to provide additional guidance ships' captains. 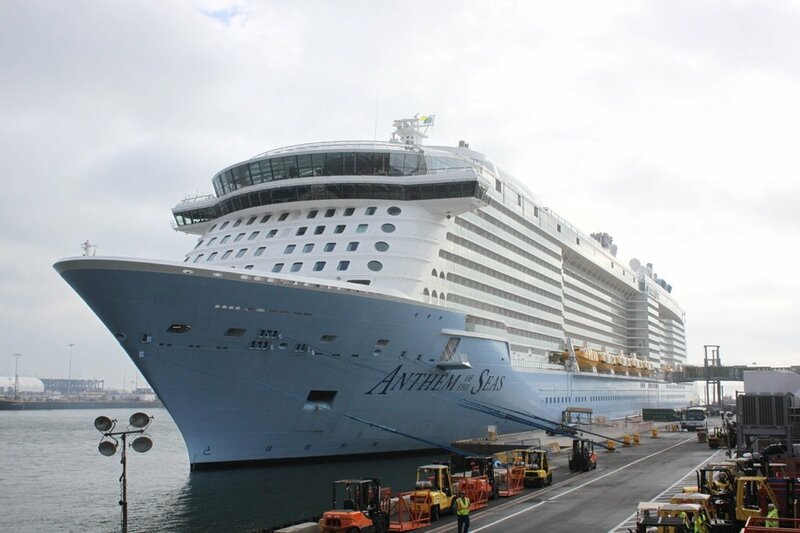 Much of the superficial damage to Anthem of the Seas has been repaired and the company expects Anthem of the Seas to resume her planned itinerary for next week's cruise. What do you think of Royal Caribbean's response? Share your thoughts in the comments! Royal Caribbean's Anthem of the Seas is returning home to Cape Liberty, New Jersey after encountering a severe winter storm in the Atlantic. Royal Caribbean announced the ship will return to her homeport out of concern for guests' comfort due to the weather forecast in the area. Royal Caribbean issued a statement, where it explained that th decision was made, "due to weather forecasted for the next few days that is likely to impact the ship’s original itinerary. We are also sensitive to the fact that our guests have already been through an uncomfortable ride. Returning to Cape Liberty minimizes the risks of further bad weather affecting our guests’ voyage; we are optimistic that they will have a smooth sail home." Royal Caribbean is giving all guests aboard Anthem of the Seas a full refund and a future cruise certificate worth 50% of the cruise fare paid. Royal Caribbean also reitterated its commitment to the safety of its guests, crew and ship, "Safety is our highest priority and ships are designed to withstand even more extreme circumstances than Anthem of the Seas encountered. While the weather was unpleasant, the ship remained seaworthy at all times." Anthem of the Seas encountered a sever winter storm off on Sunday that had to deal with waves over 30 feet in height and wind speeds exceeding 100 miles per hour. Royal Caribbean has been forced to change the itinerary for some of its cruise ships due to the path of Snowstorm Jonas. Grandeur of the Seas will return to Baltimore, Maryland, one day later than originally scheduled. The next sailing will now begin on Monday, January 25. Guests on the upcoming cruise should arrive to the terminal on Monday. A letter with additional details on Grandeur’s itinerary will be provided at check in. Anthem of the Seaswill return to Cape Liberty in Bayonne, New Jersey, one day later than originally scheduled. The next sailing will now begin on Tuesday, January 26. Guests on the next sailing should arrive to the terminal on Tuesday during their scheduled check in time. A letter with additional details on Anthem’s itinerary will be provided to guests at check in. 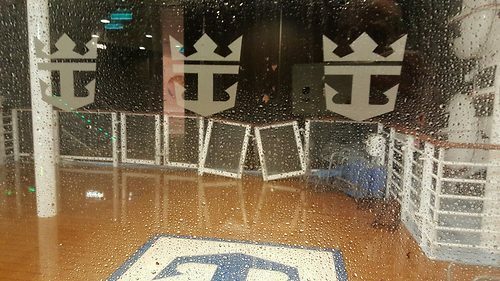 Royal Caribbean will continue to closely monitor weather conditions and will update this information if there are any changes. Of all the entertainment shown in Two70 on Royal Caribbean's Anthem of the Seas, "Leonardo's Dreams" blew me away from a visual aspect and today we have an inside look at how this film was created. Leonardo's Dreams is a five-minute Vistarama and Roboshow display onboard Anthem of the Seas that takes a look at the ideas Leonardo Da Vinci created and turns them into reality. The highlight of the show is a simulation of Da Vinci's flying machine that soars over the rooftops of Rome.